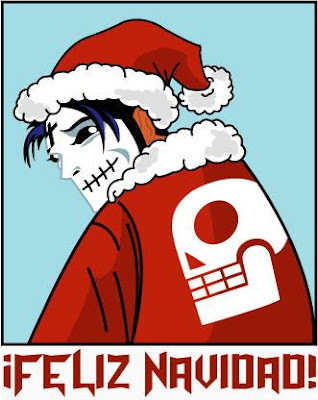 Here's an EL MUERTO Christmas poem I wrote back in 2006 for this blog. For any newcomers, here's the link! Thanks to everyone for reading my ramblings here over the past year. I always appreciate it when people tune in to what I have to say! Everyone have a Happy Holiday Season and Merry Christmas! 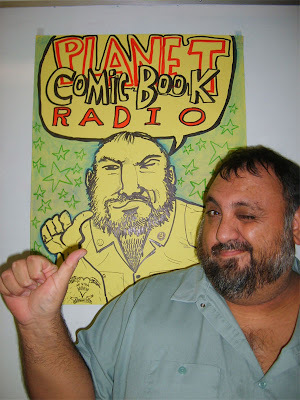 On Nov. 25, I had my 1 Year Anniversary podcast of my internet radio show, PLANET COMIC BOOK RADIO. There's been a little delay in getting the podcat edited and uploaded, but I was informed the other day by producer Renato Aguirre that he finally got it done! 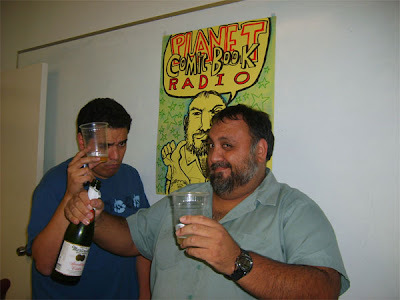 My first show was actually podcast live on Nov. 20, 2007. My inaugural guest for that show was good friend and publisher/creator JASON MARTIN. Jason called in again for the Anniversary show to with me well and update us on his latest projects. Here's what it looks like as I'm talking to Jason on the show. 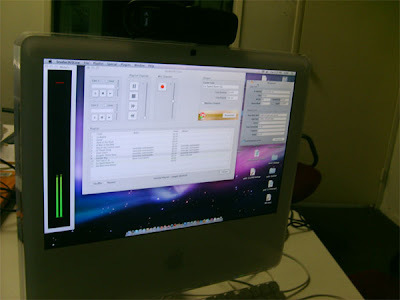 Yep, PCBR is proud to use Apple products for our podcasting! 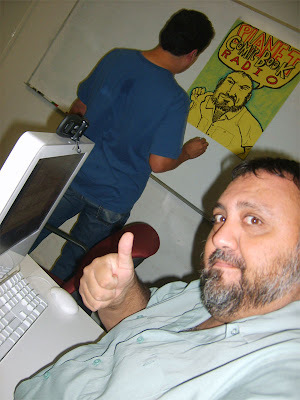 Joining me in the studio were my fellow producer RENATO AGUIRRE and friend and Cartoonista Co-founder JIM LUJAN! Jimmy actually drew me a brand new PCBR poster during my interviews with Renato and Jason! Here's me multi-tasking: Interviewing Jason Martin via phone, and taking a pic of myself, with ol' Jimmy Lujan working his marker magic in the background! Hey Jimmy, I like it! I really like it! To cap off this special podcast, we cracked open the cider! Yeah, I know, I was hoping for champagne, but since we do actually podcast from a school (The Digital Business and Design College), we had to kinda lay low on the booze! No doubt about it, this was a great way to celebrate a year of great interviews. I can honestly say that doing this show has been tremendously enriching for me this past year. My idea was always to put the spotlight on the many great, hard-working and talented artists I know of, either personally or through their work. As a self-published cartoonist myself, I know the sometimes lonely task of going about our work and wondering if we're reaching anyone. With this show, I feel grateful to be able to help these cartoonists get their name out there. Sure, it's not like we've got Howard Stern numbers, but a popular interview on my show can reach many listeners across the land (and beyond). I often have guests in the studio, and what's fun about that is we can talk face to face and afterwards grab some dinner after the podcast! Our preferred restaurant at PCBR is ALBERTO'S MEXICAN FOOD, located right down the street from our studio. But the majority of my guests have been phone interviews. 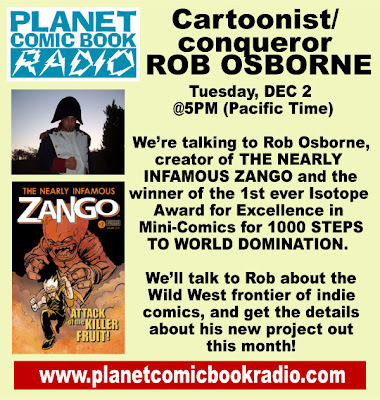 Besides cartoonists and indie publishers, my guest have included folks within the greater comic book culture. I've had Tommy, who runs the famous Bat-Blog, talk about how and why he runs a Batman website. Blake Bell has been on the show to talk about his book on Steve Ditko. And probably the one interview which for me was a personal dream come true, I was able to interview Peter Fernandez, the voice of Speed Racer! Peter not only voiced the original cartoons, but was responsible for writing and directing the English translation of this classic Japanese cartoon. 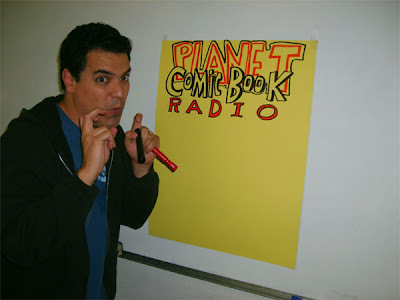 Speed Racer of course is my favorite cartoon series of all time, and to have been able to talk to Peter was without a doubt one of the great benefits of having started this radio show in the first place. Another show that stands to me is the Bill Mantlo tribute episode. Bill was a tremendously prolific comic book writer in the 70s and 80s. His were some of the first books I read off the comics spinner rack, and he's always been one of my favorite writers. About 15 years ago, he was injured in a serious accident, which has left him in the care of his brother Mike. So I contacted Mike and asked if he could come on the show and share with us some memories of his brother Bill. I also invited David Yurkovich, who wrote a tribute magazine for Bill Mantlo. This was another one of those special shows that makes me grateful that I have a show like this. So as the show enters it's second year, I hope to continue with bringing more independent artists in the spotlight. And I also want to expand a little bit with even more guests that fit into the 'wider comic book culture'. Folks who may not necessarily create independent comics, but who work on books, magazines,websites devoted to comics, or have even worked on film and television projects with comic book ties. But my main focuse will be the people who create comics, and do so under their own hard work and independent spirit! Check out Rob's website to see his new secret project!